New Delhi/Mumbai: It wasn’t a happy augury for the ninth edition of the Indian Premier League (IPL). Two days before the start of the popular Twenty20 cricket tournament, the not-for-profit Lok Satta Movement moved court, seeking to shift all matches to be played in Mumbai out of the city. The reason: 6 million litres of precious water would be spent on ground management at the Wankhede Stadium at a time when Maharashtra state, of which Mumbai is the capital, is in the grip of a drought and battling an acute water shortage, Lok Satta argued. The organizers breathed a sigh of relief when the court allowed the opening match on 9 April, between defending champions Mumbai Indians and new franchise Rising Pune Supergiants, another Maharashtra team, to go ahead. But the breather was short-lived. On 13 April, the Bombay high court ordered the Board of Control for Cricket in India (BCCI) to shift all IPL matches to be played in Maharashtra after 30 April—a total of 10 to be played at three venues—out of the drought-hit state in a ruling that would hurt ticket sales and the revenue of three franchisees—Mumbai Indians, Rising Pune and Kings XI Punjab—that have their bases in Mumbai, Pune and Nagpur, respectively. “Several people are dying because of water scarcity. This court cannot ignore the plight of such people," a division bench comprising justices V.M. Kanade and M.S. Karnik ruled. BCCI secretary Anurag Thakur saw the petition as an attempt to create an air of negativity around IPL. “We are not using drinking water; we have said that we will use treated sewage water only. How many swimming pools of five-star hotels have been shut? Have people stopped watering their lawns?" asked Thakur. But negativity has been a regular feature of IPL since its inception in 2008, never mind the fact that it has proven to be a hugely popular tournament, a money spinner and become synonymous with the commercialization of sport in cricket-crazy India. By past precedents, the Bombay high court ruling was only a minor hiccup. This year, IPL features two new, temporary franchisees—Pune and Gujarat Lions—filling in for the Chennai Super Kings (CSK) and Rajasthan Royals, which were suspended for two years in 2015 after a panel appointed by the Supreme Court probed a two-year-old betting scandal. The panel headed by former Supreme Court judge R.M. Lodha suspended Gurunath Meiyappan, team principal of CSK, and Raj Kundra, co-owner of Rajasthan Royals, for life from all cricket-related activities for betting and bringing the IPL and the game of cricket into “disrepute". The scandal goes back to 2013, when medium-fast bowler S. Sreesanth and spinner Ankeet Chavan were banned for life from the game after being indicted for spot fixing, which refers to a player deliberately bowling a no-ball or a wide, or a delivery that can be hit for runs by the opposing team’s batsman. Haryana off-spinner Ajit Chandila and Mumbai batsman Hiken Shah were punished in January this year, the former with a life ban and the latter with a five-year suspension. Lalit Modi, the first chairman and commissioner of IPL, is in exile in the UK, after being suspended from the posts in 2010. The BCCI slapped a life ban on him in 2013 after an investigation found him guilty of charges including financial irregularities, indiscipline and “actions detrimental to the interest" of the cricket board. There have been other controversies, too; for instance, about a conflict of interest in BCCI former chairman N. Srinivasan owning the Chennai Super Kings team when still heading the board. Such scandals should have tarnished the brand image of any sporting property, but the eight-team IPL has survived, even thrived. The cumulative reach of IPL grew from 102 million in season 1 to 192 million in season 8, according to official broadcaster Sony Pictures Networks India Pvt. Ltd. The channel’s revenue has grown from an estimated ₹ 300 crore to well in excess of ₹ 1,000 crore over the past eight seasons, as per media buyer estimates. A report by American Appraisal, a valuation services company, last year put the overall brand value of IPL as a business at an eye-popping $3.5 billion, up 9% from 2014. According to the report, the combined value of IPL franchisee brands rose 6% to reach an estimated $432 million in 2015. In December, India’s cricket board raised between ₹ 340 crore and ₹ 360 crore in auction proceeds from Delhi-based mobile phone maker Intex Technologies and Kolkata-based New Rising, owned by businessman Sanjiv Goenka, for the two new teams—a considerable sum given that they will play in the league only for two seasons. “It’s the biggest sports league which has been born in the last 10 years," said Rohit Gupta, president of Sony Pictures Networks India. “There is no other league in the world, forget India, which has come up in the last 10 years." This year, in its first fortnight, IPL 9 achieved a cumulative reach of 266 million, continuing to build a larger audience base than ever before, according to Prasana Krishnan, executive vice-president and business head, sports cluster, Sony Pictures Networks India. While the viewership is not comparable with that for the previous two seasons, owing to a change in measurement systems, it is indicative of the large-scale, pan-India reach of IPL. The short format of IPL has attracted a lot of young people and women to the game, said Gupta. “Even when you go into a stadium, 30-40% watching the game are young people and women. So, the youth which had moved away from cricket because of the long format has come back for T20 IPL," said Gupta. And millions more are watching the tournament on Hotstar, the mobile streaming app of Star India Pvt. Ltd, which is on track to exceeding its target of 100 million viewers this year, according to Ajit Mohan, CEO, Hotstar. “With over 60 million downloads in a year, we have become the primary screen for young India, including for cricket and IPL," Mohan said. Over the years, since its inception, IPL has gone beyond sport, mixing cricket and its brightest stars from India and overseas with entertainment to produce a complete commercial package, including the presence of attractive cheerleaders—a first in India—and a raft of technical innovations to infuse greater interest in the game. The presence of popular movie stars such as Shah Rukh Khan, owner of the Kolkata Knight Riders, and Preity Zinta, part-owner of Kings XI Punjab, at the grounds rooting for their teams has added to the glamour quotient. The first IPL season was in 2008 and the tournament was an immediate hit with spectators. Broadcasting and sponsorship cash poured in, confirming India’s status as the game’s financial powerhouse. “It’s changed the way cricket was both viewed in India and also seen in India once you are inside the stadium. The first match we had was in Bengaluru and (New Zealand’s) Brendon McCullum scored a century; and in those days, in 20 overs, to make a century was unheard of. After that, the first rating came one week later, it was an unprecedented success," said Sony’s Gupta. A bit of its charm, however, may be fading, especially for ticket-purchasing fans. Although TV viewership numbers may seem impressive, the buzz around IPL 9 has been distinctively less compared with past years. “If you see the numbers by themselves and not in comparison (to the previous years), they are impressive to begin with. If any general entertainment channel or news channel ever bagged those figures, they would be over the moon! Having said that, one cannot deny some amount of sluggishness that has set in," said Gaurav Kalra, senior editor at website ESPN Cricinfo.com. “There is a sameness to the concept, from the number of teams, and number of players to the format. Like a daily soap, audiences are largely aware of what to expect," Kalra said. To be sure, that may be due to a surfeit of cricket. India played in Australia, then Sri Lanka, the Asia Cup and the World T20 tournament in the prelude to this year’s IPL, he noted. “But by and large, a certain sluggishness has set in. This season hasn’t grabbed you by the collar as the previous seasons have," he added. Mohit Burman, one of the owners of Kings XI Punjab, agrees. “IPL 9 has been disappointing both in stadium footfalls and on TV viewership, with both down from last year’s numbers," Burman said. “May be it is due to the IPL season falling straight after the World T20 and fans feel they have seen a lot of cricket," Burman said in an email. “Regardless, we are not concerned and believe this dip is an anomaly. IPL season 9 will finish strongly and lead into a better IPL season 10." Twenty20 matches typically last a little longer than three hours. The firecracker format is ideal for big-hitting batsmen to entertain fans who have gradually grown weary of Test and one-day international (ODI) cricket—a fact borne out by viewership numbers. “I remember, we had the ICC (International Cricket Council) World Cup rights from 2002-07. What we saw at the end of the contract was that there was a decline in viewership of the ODI format," said Sony’s Gupta. “People just didn’t have eight hours to watch a match. The T20 format was just coming up that time in 2006-07. We knew this was the format of the future and so we went ahead and put a lot of money behind it." Singapore-based World Sport Group bagged the IPL broadcasting rights for 10 years in 2008 by spending $918 million. A year later, the contract was replaced when Sony Group (through Multi-Screen Media Pvt. Ltd) paid $1.63 billion for nine years’ broadcasting rights. When the broadcast rights for IPL come up for grabs next year, Sony intends to bid again. “It’s the logical thing to do. It’s our tournament, we built the property, it’s our baby, so whatever it takes, we will go with it. We are not going to let it go," Gupta said. 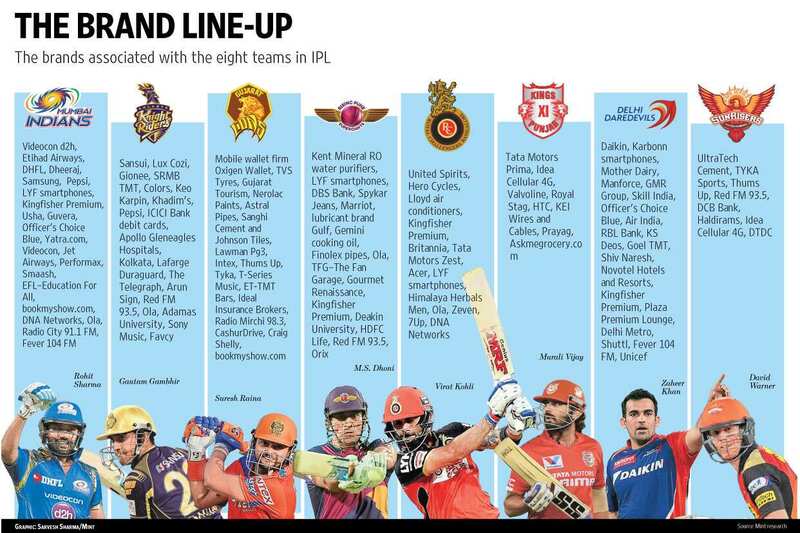 The fact that the buzz around IPL season 9 has abated in decibel levels hasn’t deterred advertisers. The tournament remains the preferred platform for the launch of new campaigns for products ranging from a new summer drink to a new smartphone, much as the Super Bowl is in the US. This season, IPL has seen 24 new brands associating with the sports property on ground, both with the tournament and individual franchises, according to GroupM, the media buying agency of WPP Plc. They include DBS Bank, male personal care products brand Himalaya Men and Freecharge, the payments unit of e-commerce marketplace Snapdeal. In terms of advertiser interest on-air, IPL 2016 has witnessed 59 advertisers being active so far in the tournament (a jump of 40% in the number of advertisers vs 2015), clearly indicating the attractiveness of the property. “Brands within ‘smartphones’ as a category are fighting tooth and nail for a greater share of voice in IPL since it is indisputably India’s best pan-India marketing platform offering instant reach, impact and connect," said C.V.L. Srinivas, CEO, GroupM South Asia. Mobile-phone services provider Vodafone has been associated with IPL since inception. “Vodafone has been the only national brand to be associated with the IPL for nine years now. This is a national sporting property and, in that sense, there is no other platform that comes close to its size and stature to deepen engagements with our consumers," said Siddharth Banerjee, national head of brand communication and insights, Vodafone India. “The fact is that we have invested significant amounts in building our network and the IPL has given us a platform to not only deepen brand love, but also tell stories about services and offerings," he added. In October, BCCI announced that Vivo Mobile India, the Indian arm of Guangdong-based Chinese mobile communications firm Vivo Electronics Ltd, will replace PepsiCo India Holdings Pvt. Ltd as the title sponsor of IPL for the next two seasons. In 2012, PepsiCo paid ₹ 396.8 crore for IPL’s title sponsorship between 2013 and 2017, but decided to end its association early. According to the contract, PepsiCo paid ₹ 206 crore for the first three years and was supposed to pay ₹ 190 crore for the remainder of the five-year deal. BCCI has not disclosed the amount paid by the Chinese mobile maker. Vivo seems to be happy with its association thus far. “The evolution of IPL as a brand is an example of successful product innovation, which effectively combines entertainment and sports. We are also receiving excellent response for our newly launched campaign with our brand ambassador (movie star) Ranveer Singh. With double impact, of Vivo being the title sponsor and TVC campaign, the brand recall of Vivo is at an all-time high in India," said Jerome Chen, deputy general manager, Vivo India. To be sure, IPL as a league is maturing and so are its audiences, who are making choices about whether to watch it at the stadium, at home on television or on their mobile devices on the go. Before it turns 10 next year, IPL finds itself in a position where growth will stabilize at more realistic levels from the exponential growth rates it experienced in its early years, analysts say. “Brand IPL has become a lot more consistent. The first few years saw tremendous growth in excess of 40-50% across all revenue segments," said Indranil Das Blah, chief operating officer at Kwan Entertainment and Marketing Solutions. “I think IPL season 5 is when a (price) correction happened across the board and there was a dip in viewership; but today, it’s a property that generates a sustained growth of 10-20%. It’s the sign of a matured product, there are no crazy highs and lows every year."